This is also the reason I chose to avoid the Kindle. Amazon has their own proprietary format and DRM for e-books; they don't support other vendors' books on their readers, nor their books on other company's readers. I have found, however, that this restriction is easy to get around, with the right software. I am free to buy e-books from any vendor and load them on a device from any vendor, Amazon included. In the 11 months since I bought my Nook Simple Touch, the market has evolved. Both Barnes & Noble and Amazon have come out with lighted e-ink readers. Both companies have tablet-style readers. Barnes & Noble is spinning off their Nook division to a separate company. An antitrust lawsuit has resulted in actual price differentiation in the e-book market once again, and Amazon once again clearly has the lower prices and best promotions. In fact despite my owning a Nook, most of my e-book purchases have been from Amazon. I have only purchased one (non-free) e-book from the Nook store. The rest have been from Kobo, StoryBundle, and the Humble Bundle (and also one from Google for 25 cents). I got a $25 Barnes & Noble gift card for Christmas from my parents. I have loaded it onto my account, but I haven't spent any of it yet. Every e-book purchase I want to make, it's never the best price. I will probably use it to get the next installment in the Game of Thrones series (whenever that eventually comes out), since new releases tend to have the same price in most places. There is also the issue of Amazon Prime. Last summer, I switched from Netflix to Amazon Prime for streaming video. Our Blu-ray player has built-in support for both. The selection of free streaming movies isn't nearly as good, but they do have an excellent selection of TV shows, including all of Star Trek, Firefly, and several other sci-fi series. The free two-day shipping from Amazon with no minimum order (which I was able to extend to four additional friends' accounts) makes it an excellent deal. I'm hooked. The value of Amazon's streaming would definitely be increased if I had a Kindle Fire. Thus far, Amazon has not released their Instant Video player for Android. This despite the facts that Kindles are built on Android, and they have a player for iOS. Their excuse is that Android isn't secure enough, and their video partners wouldn't let them stream their content if they had an Android player. This doesn't seem to have stopped Netflix, Flixster, RedBox, the Google Play store and several others from offering streaming players on Android. The transparent artificiality of this restriction alone makes me not want to buy a Kindle Fire. It's simply a bad way to treat your customers, and it makes me want to look elsewhere. The Kindle Fire devices aren't that good when compared to other tablets. If I'm going to spend money on a dedicated tablet, I would much prefer a Nexus device. All things considered, my actual plan for tablet functionality is to get a touchscreen Windows 8 convertible laptop/tablet. My current laptop is nearing the end of its life, and I'm keeping my eyes open for devices like Lenovo's Yoga and Helix lines, which are full PCs, but also have tablet functionality and form factor, and a tablet app ecosystem that I believe will do well over time. The other benefit of owning a Kindle device is access to the Kindle Lending Library. The best way to take advantage of this would be with an e-ink reader, which is definitely my preferred reading medium. 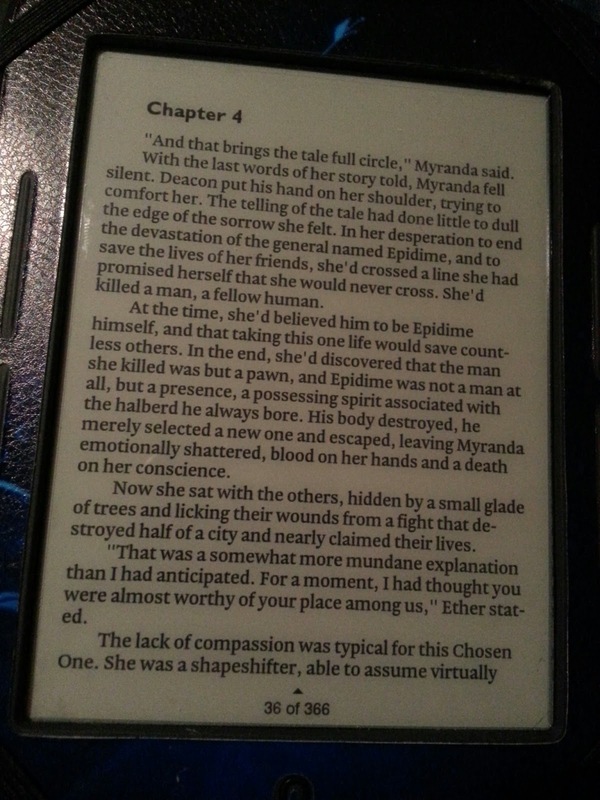 If I were to get a Kindle Fire, I would want to keep my Nook around for most actual reading. That's another reason I'm not very interested in the Fire. Built-in illumination - at the time I bought my Nook, I didn't want to be doing a lot of reading in bed. These days, mostly because of how Shoshana's condition has effected our lives, I have been doing a lot of reading in bed when Elizabeth and I have different sleep schedules, and in darkened hospital rooms while Shoshana sleeps. Kindle-specific features, such as "X-Ray", Whispersync, Time to Read, and upcoming Goodreads integration (Amazon is buying Goodreads). I don't regret buying my Nook. It was a good decision at the time, and it was fun to root it and customize it. Managing the rooted environment has become somewhat of a chore, and it is a definite drain on battery life. If I buy the Kindle Paperwhite, I will be able to sell my Nook Simple Touch for at least $50. Including the skin and case (and the option of root or not) should increase that price. I have some birthday money still burning a hole in my pocket. 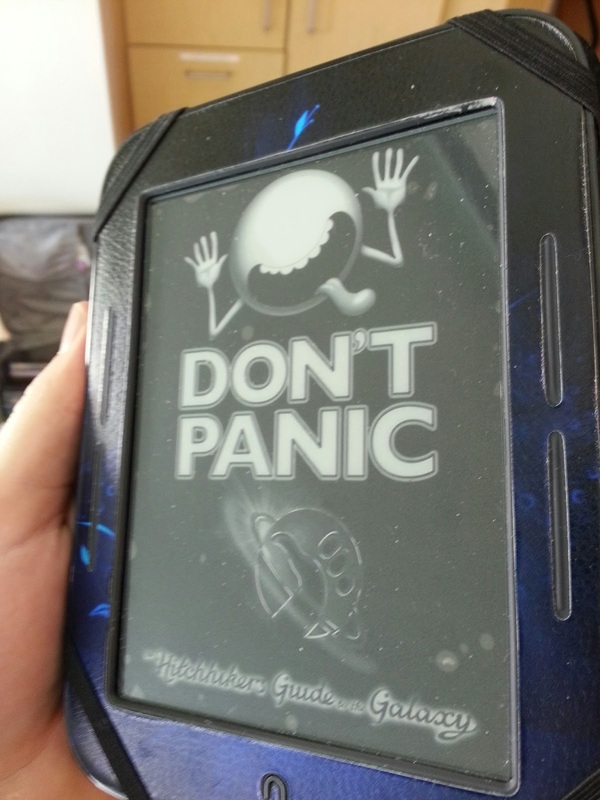 I will miss the Nook's physical page turn buttons and wide grip. I will miss the ability to supply my own screensaver images. I will not miss the Nook ecosystem. 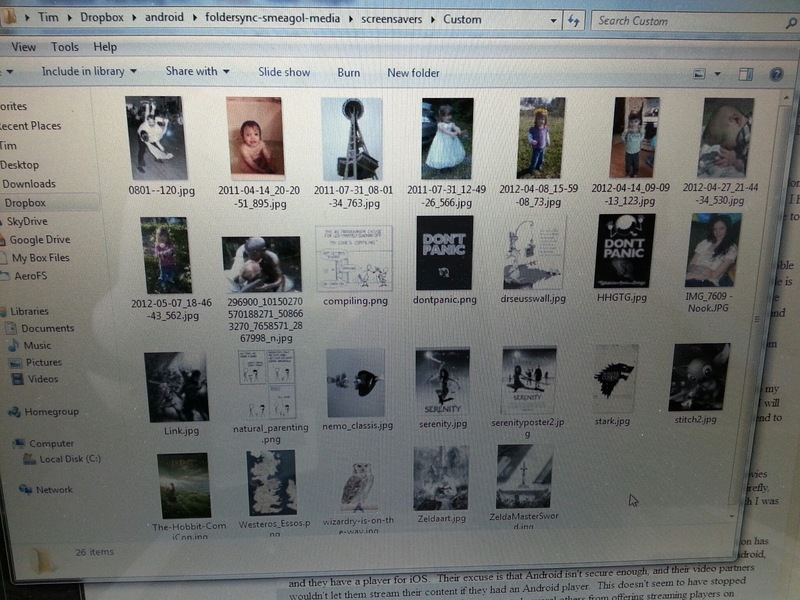 My folder of Nook screensavers. Definitely preferable to Kindle's ads. Having written this post, and come to the conclusion that I "want" a Kindle Paperwhite, actually finding one for a reasonable price is my next challenge. I don't think the extra advantages warrant the full $119 + tax retail price of the Paperwhite. I do like to read a lot, and the more I use a device, the more money it is worth investing in the quality of that experience, but I already have an e-reader that works perfectly well for most things (except reading in the dark), so it's hard to justify the extra expenditure.